I am a Breastfeeding, Bed-sharing, Babywearing, gentle parent to a rainbow princess and her sweet sidekick. A certified Breastfeeding Counselor, wife to a supportive and caring husband & father, and a science professional by trade turned Stay-At-Home-Mom living in the suburbs of Philadelphia. I graduated with a Bachelors of Science in Biology and spent seven years in the vaccines industry before making the decision to stay home for my family. I enjoy a good book, a great meal, conversation, and days spent in the sunshine. 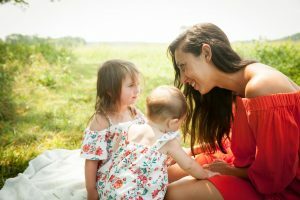 My motherhood journey has been tumultuous – I’ve been through it all – Infertility, Recurrent miscarriages, Breastfeeding struggles, Hospital Birth, Home birth, Post Partum Depression- you name it. But through it all, I still thank God everyday for giving me the privilege to have these two miracles under my wing. I feel all of my experiences have given me a greater appreciation for all that comes with motherhood and the insight and passion to help other mothers that find themselves scared and lost like we so often do. I have become fascinated and mesmerized by pregnancy, birth, breastfeeding, mother-infant bonding and so much more. I feel the process of creating and sustaining life is the closest thing to a miracle we can experience here on earth. I find so much beauty in it all…I can only describe motherhood as hearing a song that moves you to tears for the first time but never tiring of it. If I can inspire just one mother to follow her instincts and feel empowered and confident in herself or to know that she is not alone, I will feel like a success. This is a place where I can channel some of my passion and hopefully help others in the process. I hope you enjoy reading!